Natural Balance Foods, maker of the popular whole food brand Nakd, has announced that it will be launching two new products to the UK market. These two new products are actually new flavours that are an addition to the infused raisin range. The Nakd Infused Raisin has always been a popular snack food since it was introduced to the UK market. This is why the company has come up with two additional flavours to offer consumers with more variety. The new infused raisin flavours are Crazy Cola and Tangy Lime. These new products also provide retailers with an opportunity to develop their line of healthy snacks. All Nakd Infused Raisin flavours have no artificial preservatives, flavours, colours. It also does not contain any additional sugars and has undergone only minimal processing. Even though the infused raisins line is aimed at consumers of all ages, it will be most appealing to children, especially the Crazy Cola variety. Parents will also be provided with a choice, other than those of sugar laden and processed confectionery. As with other Nakd Infused Raisin varieties, the two new flavours are packed in eye-catching bags, which have been designed for convenient and on-the-go snacking. 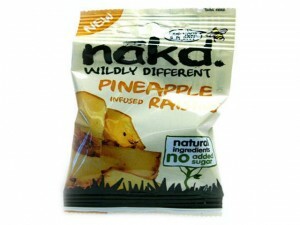 Other varieties of the Nakd Infused Raisin range are Cherry, Pineapple, Lemon and Orange. According to Natural Balance Food’s Managing Director Jamie Combs, the main reason why the company decided to come up with these two bold flavours is because of the increasing demand for whole food products that are natural. Combs added that the company feels more confident that the products will achieve success in the confectionery industry. The products’ unique taste will also provide consumers with a new direction, one that offers an option for healthy snacking.